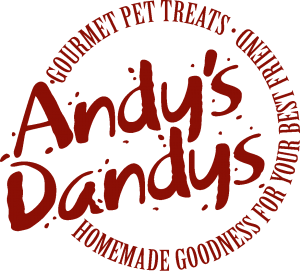 Andy’s Dandys Doggie Delights was born in a home kitchen in Richmond, Vermont in 2008. Andy’s Dandys evolved from Andrew’s passion for exploring creative, healthy recipes and from his devotion to his dog, Rosie. His family’s original goal was to create a business for him to ensure he would have meaningful employment upon his completion of high school. Andy is proud to be a business owner and is very involved in many aspects of the business. He enjoys baking the treats, to decorating them and then making deliveries to our local retail partners and promoting his business at trade shows and seasonal events. Today, Andy’s Dandys operates out of a small commercial bakery in the downtown sector of Richmond, where they bake thousands of treats every week! Andrew’s mom Lucie helps run the bakery, while her friend and business partner Lesha, a special educator, designs and implements individualized work training programs for other young adults with special needs. Their mission has evolved from supporting their own son in his growth from high school to adult work life, to serving other young adults with special needs. They teach real work-based concepts and skills that can be applied in their job search for future employment. Andy’s Dandys is proud to say that they have hired several of their own program graduates!